This review was written by Russian journalist Ray Garraty (not his real name obviously – it appears to be a homage to Stephen King, as Garraty is the main protagonist in that author’s The Long Walk novel, published under the pseudonym Richard Bachman in 1979) and appears on Ray’s Endless Falls Up blog. I already wrote about the books released by Nightjar Press (damn, I reviewed all their books! ), launched a series of dual release of so-called chapbooks – one book /one story. All six currently published books contained the outstanding story, picking up a very high standard for writers working in the area of dark literature. Now we have yet another British publisher, who is also engaged in production of chapbooks. The first their book came out very strong. 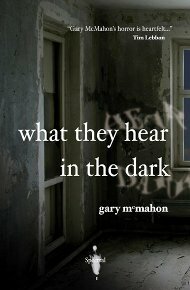 Gary McMahon is far from the debutant, he is the author of numerous novels, as well as several collections of short stories. What They Hear in the Dark is a wonderful example of how not using the straight-line methods, you can whip up the atmosphere, reducing the fantastic element in essence to a minimum. After the violent death of their son, husband and wife moved into a new house, hoping to start anew. House, as well as their family life, is not at its best: want to repair. A place where spouses can escape from the oppressive emptiness becomes Quiet Room. In this room there is completely darkness, and most importantly – it has absolutely no sound. In this room, the sounds do not penetrate outside and extinguished all the sounds inside. The room becomes something like a drug for Rob and Becky. This story is not a one-time reading, although I still will not reveal further the plot. McMahon feels what often overlooked by many authors of horror fiction: the worst lives always inside the person, not outside. The author describes the reliability of the person who lost the most precious thing in my life and does not know how to live. A promising debut of a new publishing house. We will follow what Spectral Press will present us next time. Fantastic! Doing the booty-shkin’ happy dance for you!